Homemade cleaning products, such as homemade all purpose cleaner, can be just as effective as commercial products. All purpose cleaners are used to remove dirt and grease, and are generally mild. They are versatile because they can be used on so many types of surfaces. However, they are not disinfectants. 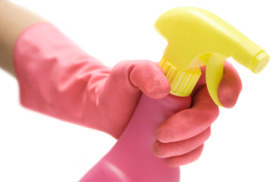 Below are four recipes for homemade all purpose cleaner. Warning: Do not use this cleaner on fiberglass or aluminum. Mix ingredients into a bucket. Combine the ingredients in a spray bottle, and shake well before each use. Warning: As with all cleaners containing ammonia, do not use this cleaner on fiberglass or aluminum. Mix the solution into a spray bottle. This gentle cleaner can be used on hard surfaces to remove dirt and grease. For all four homemade cleaning recipes listed above rinse thoroughly after using them to clean. You may also like to see these recipes for natural all purpose cleaners if you are looking for some additional green alternatives. Do You Have A Homemade All Purpose Cleaner Recipe To Share? If so, share your own homemade all purpose cleaner recipe here.